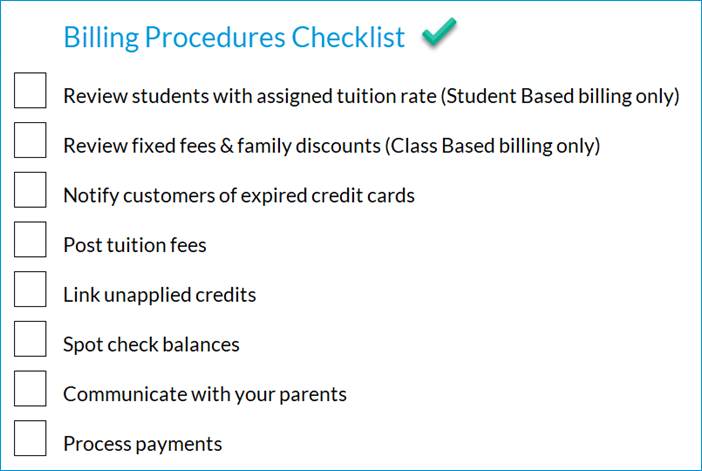 Jackrabbit allows you to post tuition fees and process ePayments in a batch, saving you lots of time and money! Posting Fees should be completed prior to processing payments to make fee linking easy. No matter how often your tuition cycle occurs (weekly, monthly, session, or custom), you should have an established routine. If you use Fixed Fees or Family Discounts for any of your families, it is best to do a quick check to make sure these are correct. Student Fixed Fees can be found through a Students Search and Family Fixed Fees can be found through a Families Search. Family specific discount can be verified through a Families Search as well. Create the balance for your families by posting tuition fees, whether you use Student Based or Class Based Billing. Some organizations prefer to post tuition fees a few days before payment is due. This allows time to verify account balances are accurate. Use duplicate fee detection to find possible duplicates. This setting helps you avoid double-charging your clients that may have tuition fee posted to their account already. Before you post the tuition batch, use the preview screen to check for possible duplicates, ensure nothing looks off, and verify all special circumstances have been considered. When all looks correct, you can post fees! Set up Favorites once you have your criteria set. If you bill a combination of classes by total hours and class fee or your classes have a different billing cycles, favorites make it quick and easy! After posting tuition fees, it is a good idea to look for unapplied payments (full or partial) that have not been linked to fees. Run a Transactions Search to find the unapplied payments. Doing this immediately after posting fees allows you to link any unapplied payments to the new fees prior to processing payments. For more detail on this process, check out the Best Practice article Maintaining Accurate Revenue Reports. Families Search - enter a date for Has Not Had A Fee Posted Since? Use the Task list on your Dashboard to keep track of any special billing considerations per billing cycle. Before processing payments, email your parents to alert them of newly posted fees in case they need to update billing information. Include a link to your Parent Portal so families can easily login and quickly make adjustments. Jackrabbit offers the ability to send statements, via print or email to multiple families at one time. Include a link to your Parent Portal here as well. Explain your billing policies on your Online Web Registration Form to ensure your customers understand your expectations. Credit cards and bank drafts are not processed automatically. All ePayments in Jackrabbit MUST be initiated by a Jackrabbit User or the account holder through the Parent Portal. Jackrabbit allows you to batch process ePayments (credit cards and bank drafts). The summary screen can be printed once processing is complete. This report is a quick reference of transaction status (approved or declined), along with the Trans ID. Jackrabbit reports all Bank Drafts as approved. Bank Drafts can take up to 10 business days to fully settle. It is important to check your report from your processor to verify which Bank Drafts were declined as the status in Jackrabbit does not automatically update. If you have automatic decline emails setup, you do not need to reach out to the families whose payment declined via email or phone. With your Parent Portal link included, parents are more inclined to login and update their information in a flash! The time saved using ePayments within Jackrabbit is incredible. The hours spent applying payments individually to families will easily cover processing fees for merchant accounts. It is estimated that account collections are reduced by up to 30% as a result of running automatic payments. Pay yourself by saving time! Not using ePayments? Check out our ePayments webpage for more information. If you have additional questions, check out our Guide to Total ePay or email our team directly at ecommerce@jackrabbittech.com. Streamline your billing process, no matter how often you bill. Create a billing to-do list that works for you. Checkout out our sample billing checklist below!